New Windsor High School "Norsemen"
The community of New Windsor has a population of approximately 900 residents. It is situated on Il. Rt. 17 seven and one-half miles east of US. Rt. 67. If you are unfamiliar with the area, New Windsor is about 23 miles (as the crow flies) south and a little east of the Quad Cities. A nice history of the town of New Windsor can be found on the town's website address of http://www.newwindsorillinois.com/ . "The original high school classes were conducted in a building on Main Street. The lower level was the gym and the upper level housed the classrooms. The building was converted into a theatre (the Rivoli) after the new high school was built and was later demolished." "New Windsor built a 'new' brick high school in 1938. It was a WPA project of FDR's New Deal. 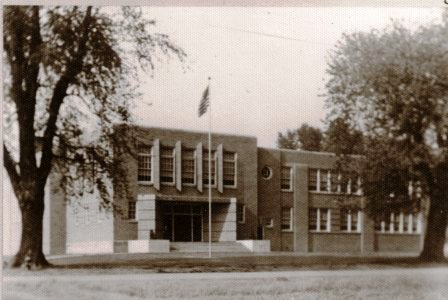 This served as the high school until Winola was formed in 1953 (the merger of Viola and New Windsor into one school district), and then became the Winola Junior High School until Winola annexed into the Sherrard school district in the 1988-89 school year . The building is in excellent condition today, being used in a variety of functions as remodeled by Thurman Williams." 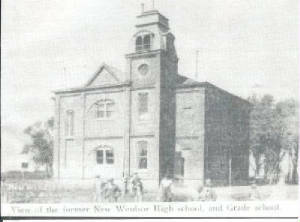 "This is a copy of a picture of New Windsor High School taken prior to 1946. It is scanned from my father’s class picture when he graduated in 1946. I attended the school when it was Winola Junior High School in the 1960s and lived only a block from the school." A consolidation effort took place between New Windsor and its neighboring town Viola in 1952. The new school system was named "Winola" with the high school situated in Viola. New Windsor High School offered many sports during its existence. The only record of success on the IHSA web site (www.ihsa.org) is in Boy's Basketball. It is probable New Windsor also offered football, baseball, and track, however further information and verification is needed from an alumni of the school or a townsperson. The boy's basketball success is listed below. The New Windsor High School "Norsemen" had some very nice seasons on the hardwood court. The boys won two District Championships and competed very well with the other schools in the area. Some IHSA tournament basketball scores were located on a website titled "Illinois Postseason Basketball Scores." The scores are printed below as well. **All scores, season records, and coaches' names prior to the 1933-34 season are needed. Victoria lost in 2nd Rd. New Boston won District title. **Final game for New Windsor High School, consolidateed with Viola in 1952 to form the Winola School District. Meridith Peterson - Ranked among the area's leading scorers, scoring 234 points in 24 games played. "New Windsor adopted 'The Norsemen' as their school nickname to honor the fighting spirit of the vast number of people of Swedish descent who inhabited the town. When the Red and White of New Windsor consolidated with the Blue and White of Viola High School, the newly formed school district of Winola adopted the colors of Maroon and White. The 'Red' was mixed with the 'Blue' hence forming MAROON. The white remained the same! This new school went on to be a main stay in the old Cornbelt Conference that consisted of Alwood, Westmer, Cambridge, Rockridge, Sherrard, Orion, Atkinson and of course Winola!" "Bill King came to New Windsor to coach in 1950 and continued as the Winola coach until the '70's." "I attended new Windsor grade school from 1964 to 1972. We had 1st thru 4th in the first high school building. Then we had 5th thru 8th in the Junior High building. We were then bussed to Viola for high school."